This stunning teapot is doubled walled keeping your tea hotter for longer. The infuser inside the pot is stainless steel, easy to remove if you’re after the perfect brew. The teapot handle is designed so it stays cool. Enjoy with friends or for those that just love to make a pot sit back and relax on the sofa. Remember with enough tea you could rule the world. Double Walled means you can just enjoy chatting and relaxing without the need to keep re-boiling your kettle or making another serving of tea. Easy to clean so you can reuse your teapot straight afterwards without the need to worry about leaving remainders of a different flavoured tea. 2 litre capacity gives enough room for fuelling your friends with tea without the worry of running out of fresh tea. Stay cool handle allows you to start pouring straight away without the concern of getting your hands burnt. Why don’t all teapots have this feature? One of the many benefits of stainless steel is how easy it is to clean. This is especially important in the kitchen when it will be coming into contact with food and drink. 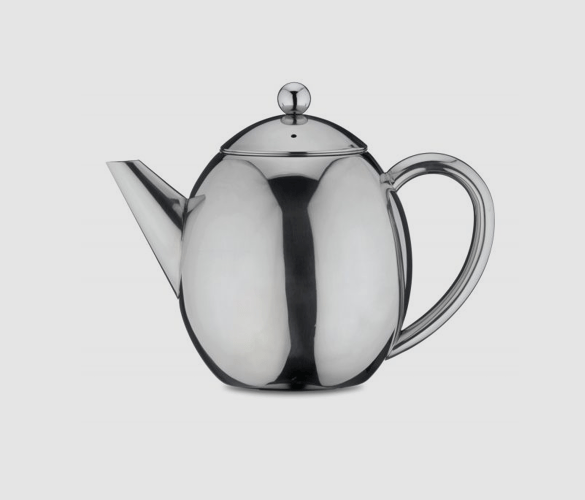 Although it is stain, rust, odour and corrosion resistant, it is important to keep on top of cleaning to keep the surface of your teapot looking shiny and new. There are many ways to clean stainless steel, and there are products designed specially for this type of cleaning. Apply white vinegar all over the surface and allow to soak in for a few seconds before washing off. Use a small amount of olive oil to polish and maintain shine. If you are trying to remove stubborn fingerprints, try using glass cleaner. Washing up liquid works well to remove grease and grime. Baking soda is a great trick for removing stubborn food or drink stains.